Though this book was written in 2001, I wanted to read it first before I read A New Kind of Christianity, which was published in 2010 (same publisher and year as Rob Bell’s Love Wins). A couple books by McLaren was enough for me but we need to know what those who are denying the faith and the Scriptures are saying. 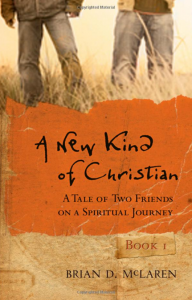 It is written in a conversational style concerning two friends who are dropping out of the pastorate because of undue pressure from evangelical and conservative believers. McLaren believes that Christianity has been mistaken for the last 500 years because we have adapted modernistic ways of thinking: absolutes, truth and error, heaven and hell, two opposites can’t both be right, etc. Even in 2001 McLaren was saying that heaven and hell are the same place where everyone goes after death. That place is perfect and without sin. Those who have understood Christ’s universal atonement (which has already saved every person) will enjoy it (“heaven”) and those who have not will not enjoy it (“hell”), but all will be there anyway. All religions lead to this place but Christianity leads to it more easily. Being “saved” becomes unnecessary and even selfish.